Tick, tock! Sunday, November 1 marks the end of Daylight Saving Time. 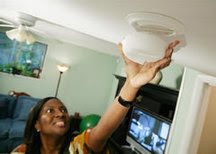 Use this opportunity to not only prepare your clocks to “fall back”, but also prepare your home for fire emergencies by changing the batteries in your smoke alarms. Develop a home fire escape plan so that everyone knows two ways out and knows a safe place to meet. Practice your plan twice per year. To learn more about fire escape planning, check out this USFA public service announcement. Change the weather radio battery too. Established by the ARRL Board of Directors in 2009, the George Hart Distinguished Service Award is given annually to an ARRL member for exemplary service to the League’s Field Organization. Selection criteria include NTS operating record, Amateur Radio Emergency Service (ARES) participation, or service to the ARRL Field Organization in terms of appointments and/or leadership positions held. Nominations should thoroughly document the nominee’s lifetime activities and achievements within the ARRL Field Organization. Nominees are expected to have at least 15 years of distinguished service. Submit nominations and related supporting material and letters of recommendation to ARRL Headquarters or mail nominating documents to ARRL Field Organization Team Supervisor Steve Ewald, WV1X (or to 225 Main St, Newington, CT 06111). Antenna Discussions/Demos and Answers to Your Questions! This week's W5KUB.com show (October 27th) will feature Emmett Hohensee, W0QH, Chief Engineer of Radiowavz, Emmett will continue discussions on different antenna types and designs. He will explain the pros and cons of the antennas and will answer your questions via the chat room or the viewer telephone lines. Next week we hope to have Joe Eisenberg, K0NEB, back with us to discuss kits that are becoming very popular with the ham community. Please send your FCC related questions to Riley Hollingsworth, K4ZDH, at AskRiley@w5kub.com. He will answer your questions on a future webcast, and in some cases, he may just call you on the phone if you leave a number. Riley retired from the FCC's Compliance and Information Bureau as Legal Adviser for Enforcement Program. Amateur Radio Roundtable is a live weekly amateur radio webcast, held every Tuesday night at 8 PM CDT (0100 UTC Wednesday) at W5KUB.com. The show covers a wide range of topics for ham radio operators and electronic hobbyists; including balloon launches, satellite, go-kits, emergency communications, SDR, digital modes, DXing, home brewing, hamfest updates, and more. Viewers will have the opportunity to ask questions via the chat room or telephone. Towards the end of each show, we provide a link and viewers who have a camera, microphone, and a Google+ account, can join the show. Your video and audio will be on the webcast. This part of the show is very informal and up to 10 people can join. We talk about anything the viewers want to discuss. We would like to share pictures of your ham shack. Send a picture of your ham shack with a description and we will feature your shack pictures on the show. In fact, if you give us your permission, your shack could be used as the background of that week's webcast! If you have a specific subject idea for a future show, send an email to tom@w5kub.com. Please help us advertise the show by sharing in Twitter and Facebook on Tuesday evenings. Forward this message to a Friend will allow you to share this message with your friends. Thanks to Mac, K2GKK for making this information available. ARRL announced an exciting new on-the-air program for next year, 2016. It is “National Parks on the Air” (NPOTA). Please read the ARRL Web news page article that introduces this year-long event starting January 1, 2016. More details and information can be found at this ARRL Web page link: http://www.arrl.org/NPOTA. **Individuals participating on their own and not with a local group should also send a SET report. Links to SET reporting forms and the EC Annual Report may be found at http://www.arrl.org/public-service-field-services-forms. After logging on the page, scroll down and look in the middle of the page for links titled "Form A: EC Simulated Emergency Test Report", "Form B: NM Simulated Emergency Test Report", and Form C: EC Annual Report." 2015 ENID HAMFEST Saturday, November 7th 8 a.m. to 3:00 p.m. TABLES $3.00 Contact W5EIY (Bill) at 580-716-4788 ornokes3139@gmail.com to reserve your tables. • AND MORE: Numerous vendor certificates, over $400, merchandise and ARRL books and certificates. TICKETS • Admission $3.00 per person. (Age 12 and under free if accompanied by adult.) Admission includes one drawing ticket. Extra tickets bundles available. Don't forget reserving your TABLES, only a few left • $3.00 each. Request tables via W5EIY (Bill) at 580-716-4788 or nokes3139@gmail.com . Pre- reserved tables not claimed by 9 a.m. will go to others in order of request. During the Simulated Emergency Test recently, the Oklahoma Section establsihed a digital net. The following is the summary of that activity. How did you do on SET? KC5MWZ ran Winmor, but no stations responded. We successfully sent one ICS-213 form from KT5DIG (Broken Arrow/Tulsa) to KC5WMZ (Oklahoma City) on 40m. Both ends of the link were 20 watts or less. We utilized the FLMSG portion of the FLDIGI suite of programs to compose and send the message. A text bulletin was also sent from KT5DIG to KC5MWZ utilizing the FLAMP "multicast&quot; software that is part of the FLDIGI suite of programs. The FLAMP software allows multiple stations to receive the same information, but individually request for portions of the file to be transmitted by the net control. Keyboard to keyboard and the forms and bulletins were 95%+ copy from each side. Lessons for the next exercise: We could have easily run BPSK-250 for faster data transfer on the HF portion of the net, perhaps PSKR-250 (robust) if error-correction was necessary. In the future, we will also transfer the other ICS forms generated by the Tulsa group into FLMSG format and send those, as well. While we monitored the VHF net in Tulsa, there was no traffic received to be routed through the digital portion of the net. We can place a representative running FLDIGI suite in physical proximity to the voice net control at future events so that message handling could be more direct. All in all, a good start and looking forward to more opportunities to use digital in the future......Which has led to some new developments since the exercise. We have successfully placed a Winmor port on our existing packet BBS in Broken Arrow. More information to follow. Thanks to Jeff AE5ME for this information. As an additional incentive, the Tulsa Digital Radio Club (TDRC) foundation will provide, free of charge, a completely functional RMS Express Station, including the tablet computer, soundcard TNC interface, and Baofeng HT dual band radio to any emergency management station that agrees to participate in the upcoming November 7th COMEX with the MARS group. This offer applies to any emergency management group in the greater Tulsa metro area, within 20 miles of Broken Arrow, OK.
For stations outside of the 20 mile area, the TDRC will provide, free of charge, a tablet computer with RMS Express and soundcard TNC interface to work with the station's existing VHF base station. For outlying stations wishing to work the HF Winmor portion, the TDRC will provide, free of charge, a tablet computer with RMS Express and soundcard TNC interface to work with the station's existing HF base station. For all three options (HT, VHF base, or HF base), TDRC personnel will meet with the operators and provide training in RMS Express and, in the case of operator provided VHF or HF stations, will install the soundcard TNC interface and tablet computer. The only "condition" is that the emergency management station operate RMS Express during the upcoming COMEX and send and receive messages with the AE5ME-15 system. Equipment is free to use as you wish after the exercise is complete. Of course, we hope you continue to see the value of RMS Express and use it as a tool for future events and exercises. Keep in mind that many of you may already have the resources to run an RMS Express station if you have a TNC built into your radio. For example, the Kenwood TS-2000 has a built-in TNC that can operate on packet by connecting to the com port on the radio. Deadline for applying for the above hardware is Saturday, October 17th in order to allow us to distribute stations and conduct training with operators prior to the exercise. Please send email to ae5me at yahoo dot com. Thanks to Jeff, AE5ME for this information. Thanks to Dave, WD5G for the following information. Main Trading Company in Paris, TX is having a big sidewalk sale on 18 Oct. This is apparently a big deal with vendors, prizes, etc. and thanks to Mac, K2GKK for sending it along. This week's W5KUB.com show (October 13th) will have a special guest, Paul Ewing, N6PSE, of San Jose, California. Paul will share pictures and discuss his past and future DXpeditions using simplicity and a basic approach. He is a retired Information Technology & Security consultant. Paul was an early Internet pioneer running the systems, networks, and data centers for Internet companies; such as, eBay, Yahoo, and Google during their early years. He has been an amateur radio operator since 1982, maintains an amateur radio blog, and is a serious DXer! Paul's DX accomplishments include:Member of the 3D2R Rotuma Island DXpedition -Sept-Oct, 2011Member of the ET3AA team from Addis Ababa, Ethiopia - December, 2011Member of the 7O6T Team from Socotra, Yemen - May 2012Co-Leader of the 3D2C Conway Reef Dxpedition - September, 2012Member of the XZ1J Myanmar DXpedition - November 15-26th, 2013Co-Leader of the E30FB Eritrea DXpedition - March, 2015Will be co-Leader of the Dxpedition to South Sandwich and South Georgia Islands - January, 2016Next week (October 20) our guest will be Dan Romanchik, KB6NU. Dan has a great amateur radio blog and has helped scores of hams upgrade their licenses. Riley Hollingsworth, Joe Eisenberg, and Emmett Hohensee have joined the show and will provide lots of new and great items for discussion. They will alternate appearances as their schedules permit. Please send your FCC related questions via email to Riley Hollingsworth, K4ZDH. Riley retired from the FCC's Compliance and Information Bureau as Legal Adviser for Enforcement Program. He will answer your questions during his next appearance. We want to share pictures of your ham shack. Send a picture of your ham shack with a description and we will feature your shack pictures on the show. In fact, if you give us your permission, your shack could be used as the background of that week's webcast! Thanks to Jerry, N5KNU for this information. the Air (JOTA), the largest gathering of Scouts throughout the world. Last year, over 1 million Scouts communicated via amateur radio. with other Scouts and others interested in Scouting and Amateur Radio. The K2BSA Amateur Radio Association offers some "talking points"
with JOTA and amateur radio. be in attendance, both on the trade floor and in the forums. will be able to help you with any need. cosponsor, in the US Senate. H.R. 1301 and SB 1685. Letters are important to elected officials. likely he/she are to support amateur radio. Please do your part. Send your letters today. & Technology Program (ETP) grants. topics as part of a longer-range plan to involve Amateur Radio. US students and educators through Amateur Radio. who are willing to serve as mentors," she explained. more information, contact Debra Johnson, K1DMJ, at ARRL Headquarters. Where: Starting Point: Sonic 2222 E. Heather, Guthrie OK 73044Starting Point is on Heather, west of the intersection. First card will be issued at 0800. Entry Fee: ~ 10.00, 50% of pot goes to winner and 50% goes to cover event expenses. Picnic/award presentation at the end of the run. hamburgers. You bring side dish. Thakns to Clay WA6LBU for this information. times of crisis or disaster. rendered by an Amateur Radio operator or group. names and addresses of all references. or decide to make no award. engraved plaque and a profile in QST and other ARRL venues. After the SET all ARES-OK leaders please send in your report. Individuals participating on their own and not with a local group should also send a SET report. You may e-mail your SET summaries to ARRL Headquarters via sewald@arrl.org. If you mail them to ARRL via the postal service, the address is: ARRL Headquarters, 225 Main Street, Newington, CT06111-1494. 1) HF Digital on 7036 kHz USB with center frequency of 1500 Hz (+/- QRM). We will operate beginning at10 AM and send traffic to KC5MWZ in OKC in FLAMP (bulletins) and FLMSG (traffic). Primary operation will be MFSK-16, with Olivia 8-500 as backup in the event of poor band conditions. Net control operator will be KT5DIG. Stations are welcome to copy the FLAMP bulletins and FLMSG traffic and send confirmation copies to AE5ME@YAHOO.COM. After contact is complete with KC5MWZ, net control will take check-ins from other stations operating on MFSK-16. At 11 AM, net control will change to PSK31 for those stations that only have PSK capabilities. HF net will conclude at 12 PM. 2) VHF Digital will be on 146.985 Mhz FM Rose Oklahoma repeater with center frequency of 1500 Hz and PL tone of 110.9 Hz. Mode will be BPSK-250. We will operate beginning at 8 AM and will send out FLAMP (bulletins) and FLMSG (traffic). Net control is KT5DIG, and we will take check-ins from other stations. Stations are welcome to copy the FLAMP bulletins and FLMSG traffic and send confirmation copies to AE5ME@YAHOO.COM. VHF net will conclude at 9 AM. 3) VHF APRS will be on 144.39 Mhz. We will operate beginning at 9 AM and will send out various bulletins. Net control is AE5ME-10 and we will take check-ins via APRS messages addressed to net control. We will also be in the ANSRVR group "OKAPRS" for those stations that use ANSRVR. Stations in "OKAPRS" can send a message to the group and net control will respond. APRS net operation will conclude at 10 AM. Several have asked about the emergency power capability of APRS. We have confirmed that several APRS digipeaters in the greater Tulsa area have emergency backup capability. The station with the most number of confirmed copies of net traffic from the various modes emailed to AE5ME@YAHOO.COM will receive a certificate of recognition from the TDRC.